There are only 15 minutes left for all players to escape from the town before you will be overrun by the zombies! Don't sit still for a second - start running now and you might just escape! 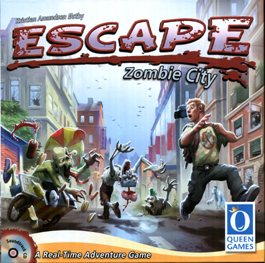 Escape - Zombie City is a cooperative real-time game. Instead of playing the game in rounds, each player rolls his five dice as quickly and as often as he can! The music begins - the tension rises. Can you escape the zombies within 15 minutes?